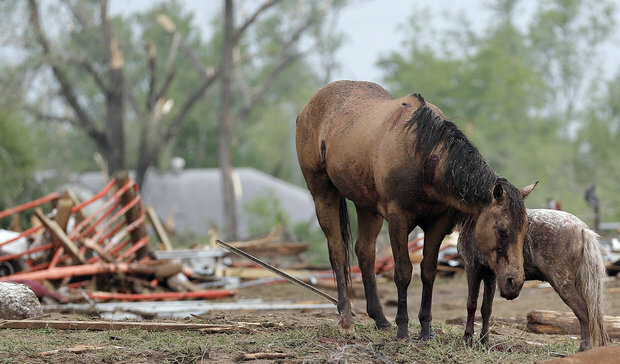 Help For Horses Affected By Tornados in Oklahoma ~ Pawsitively Humane, Inc.
A devastating tornado strucked a suburb of Oklahoma City yesterday. Many people and animals were killed and injured. This is a situation where all of us have to come together and help in anyway we can. Jim Gath from Tierra Madre Horse Sanctuary - Cave Creek, AZ, understands this very well, he has offered to help and take in any horses injured or homeless due to the tornado. He will take as many as he can fit in and fix those who need it. If you have injured horses or know about homeless horses around the area, please contact him at 480-747-1070. Also, please share this posting so we can reach more people and help these animals in need. Oh no! I was trying to tweet this and it isn't working! Thanks Caren for the notification. We'll have to hire someone to fix the coding.